Wintergreen spills down the slopes of Virginia's Blue Ridge Mountains roughly 45 miles west of Charlottesville. A master-planned private resort, it begins 3,800 feet above sea level at Devils Knob, where it overlooks the Shenandoah Valley, and ends in the valley of the Rockfish River. Altogether it covers 11,000 acres, 60 percent of which remains forested in evergreens, towering oaks, and other hardwoods. The forest also hold 13 species of orchids and one ancient fern bed estimated to be 1,000 years old. Some 30 miles of marked hiking trails thread through the property, with connections to one of the most scenic stretches of the Appalachian Trail. Ecologically sensitive, Wintergreen has long followed a philosophy of preserving as much of the natural environment as possible while still carving out space for homes, condos, golf courses, tennis courts, and ski runs. Concentrating the lodging along the ridge tops at Devils Knob meant they could leave substantial tracts of forest undisturbed, and the construction that did take place adopted the colors of the earth, rocks, and trees in order to blend with the surroundings. There are thousands of condos and homes scattered through the property, but their very unobtrusiveness would lead you to guess far fewer. Deed covenants ensure that that will never change, and so does the fact that the resort is owned not by a corporation but by the property owners themselves, who don't want to see the value of their investments undermined by the continual addition of new housing stock. Its physical beauty aside, one reason to choose Wintergreen, especially in the summer, is that temperatures at Devils Knob are typically 10 to 15 degrees cooler than those in the surrounding lowlands. Many of the second home owners come from Washington, D.C., Richmond, and other nearby cities seeking relief from the summer swelter. And it's no accident, therefore, that the largest of the resort's tennis complexes drapes across a ridge at the top of the mountains. The tennis direction falls to Kostyantyn Khodirev, who has been on staff at Wintergreen since 2013. He graduated from Ferris State Professional Tennis Management Program in Big Rapids, MI, where he specialized in tennis teaching and club management. His assistant director is Shelly Scott, who was previously director of tennis at Santa Catalina School in California and ran NIKE tennis camps at the University of California San Diego. Together they are focused on enhancing both the day-to-day roster of tennis activities as well as the adult academy program and the summer junior camps. Among the latter are 5 Nike Tennis Camps, some with an overnight option and/or tournament training option to cater to higher level players. 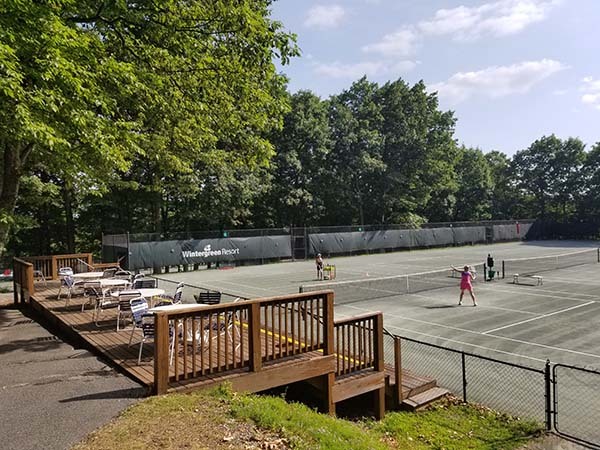 The result is that from the time the snow melts in March or April until beyond the fall foliage season in October, these courts are a haven for avid players. Tennis Programs. The Tennis Academy programs at Wintergreen run three or four days, some midweek, others over weekends. These run year round on the weekends, supplemented by midweek options on certain dates from June through August. In addition, private groups can book customized programs midweek from September through May. Sessions average 2 to 4 hours a day and include intensive drilling and supervised match play, much of it doubles. The Academy aside, the resort offers a full menu of clinics such as the Advanced Workout for 4.0's and up, Cardio Tennis, Drills for Skills, and a tactical point playing clinic called Matchplay Madness. Beyond that there are private lessons, game matching, and occasional exhibitions. Golf Courses. Wintergreen has two distinctively different golf courses: one at the top of the mountains at Devils Knob, the other in the valley below along Stoney Creek. It also has a golf academy. Devils Knob Course: Designed by Ellis Maples, a native of Pinehurst, North Carolina, this challenging 18-hole course follows the surprisingly flat ridges at the top of the mountain. At 3,850 feet it is the highest in the state, with 40 to 50 miles views of the Shenandoah and Rockfish Valleys. That elevation means summer temperatures are cooler than in the valley below but also limit its season to April through November. Par: 70. Length: 5,101-6,300 yards. Stoney Creek Course: Unlike Devils knob, which is seasonal, this 27-hole championship course remains open year-round. Rees Jones designed the original 18 holes (the Monocan and Shamokin nines), giving them roomy fairways that meander along the valley floor and feature bold mounding like that found on many British courses. He returned 10 years later to add the Tuckahoe 9, which opened in 1998. He laid it out over the hills and through woods, skirting meadows and preserved wetlands. Water hazards are plentiful and so are his trademark moundings. Par: 72. Length: 5,500-7,005 yards. Spa & Fitness Center. The Wintergarden Spa and Fitness Center stands just up the road from the Devils Knob tennis center. Recently redone, it has indoor and outdoor swimming pools, a sauna, a workout room with windows on the indoor pool, and a spa with 11 rooms for massages and beauty treatments. There is another small fitness center and pool at the golf clubhouse adjacent to the four clay courts in the valley at Stoney Creek. And ... Some 30 miles of nature trails wind through the resort, connecting at the top with the Appalachian Trail. Mountain bikes can be rented at the Adventure Center for the 7.2 mile descent to the valley floor or to take on the challenge of the obstacles at the free-ride center. Down in the valley, there is a 20-acre Lake Monocan stocked with bass and pan fish. The lake also has a dock with canoes and paddleboats, picnic areas, volleyball, and a beach of sorts. Rodes Farm at Stoney Creek, while independent of the resort, has a complete English-oriented equestrian center. The resort runs highly regarded adventurous summer children's programs for those ages 2½ to 14. During the height of summer, there is also the option for 6 to 12 year olds of a Friday and Saturday evening program in summer so parents can have their own weekend evening out and a midweek overnight campout. Lodging at Wintergreen ranges from studios and lodge rooms to seven-bedroom homes. 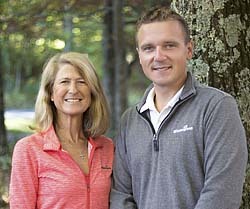 There are four restaurants at Wintergreen, three at the top of the mountain, a fourth at the golf clubhouse in Stoney Creek. Lodging ranges from studios and lodge rooms to 1-to-5-bedroom condos and 2-to-7-bedroom homes. Rates include access to the Wintergarden Spa and Fitness Center and complimentary midweek court time. Seasons. That elevation means that temperatures at the main Devils Knob tennis courts are typically 10 to 15 degrees cooler than on the valley floor below, and that helps to make Wintergreen a popular summer weekend getaway for lowlanders in places like Washington, DC, and eastern Virginia. Spring and early summer bring a spectacular display of wildflowers, autumn a blaze of fall colors. Travel Instructions. By Air: The Charlottesville/Albemarle Airport (CHO) is 44 miles from Wintergreen. It has daily service from several national carriers or their regional affiliates. From the airport, proceed through the first stop sign to the first stop light. Turn right onto Hwy. 29 South for 6 miles to the Route 250 west bypass exit. Continue for 4½ miles, exiting on I-64 west (to Staunton) and driving another 10 miles to Exit 107 Crozet, Rte. 250. Follow 250 west for 5 miles to Rte. 151 South, turn left and continue for 14.2 miles to Route 664. Turn right and proceed 4½ miles to the Wintergreen entrance. By Car: Wintergreen can be reached from the north and south on I-81, the Blue Ridge Parkway, or Rte. 29, and from the east and west on I-64 (take the exit for Rte. 250). Ask the resort for specific directions depending on your approach. General Tourist Information. Among the local attractions are Thomas Jefferson's Monticello, James Monroe's Ash Lawn-Highland, and the Historic Michie Tavern, where you can have lunch. For more information about these and other local sites, visit the Charlottesville/Albemarle Convention & Visitors Bureau website or contact them at P.O. Box 178, Charlottesville, VA 22902. Phone: 804-977-1783.